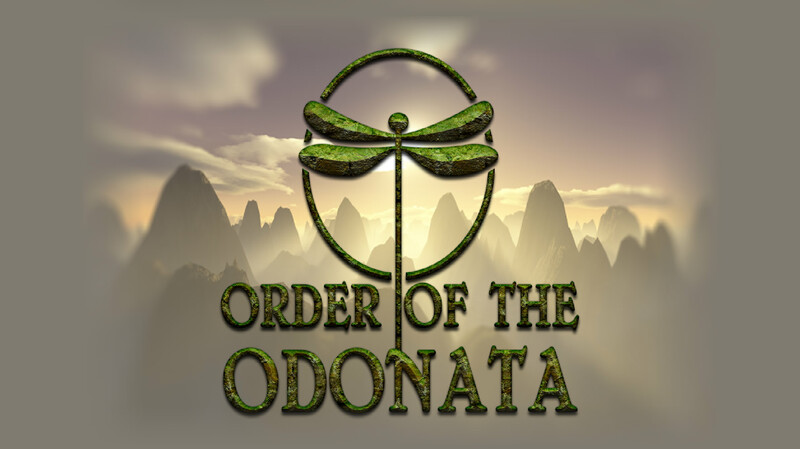 Order of the Odonata began life on February 10th 2018 after I returned from a short romantic vacation. Just prior to my vacation starting the Vinesauce Doom Mapping Contest: Hellectric Boogaloo was announced. Unfortunate, as I was unable to map for a decent portion of the mapping contest’s duration! While on my holiday I took in mental notes of the scenery in the area from our walks – lots of stone buildings and interesting architecture – I feel this heavily influenced what I decided to make for this little project! I set myself a simple objective – make a non-linear map which can be played in any order, in any direction. This map was to include a basic three-key hunt before opening up a boss arena. 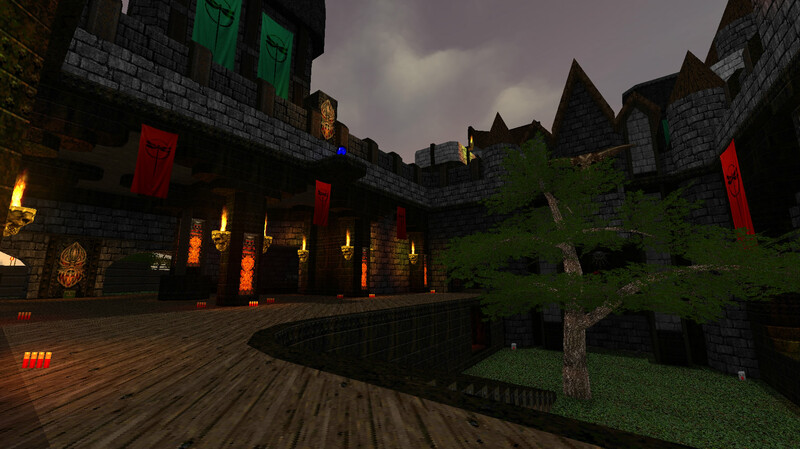 Naturally I began the map by starting to construct the central courtyard area, which is the first part of the map the player will see and will subsequently revisit several times. The Construction Of This Map Was Relatively Quick! I envisioned the map having four quarters while I was working on it – the first three would house each of the respective keys, and the final would be the boss arena. This slowly changed as I worked on the map, as after creating the first area which contained the red key I decided to create an optional path that looped all the way to the other half of the map. During a discussion on my Discord Server, I identified I had two hours spare one evening and was prompted to make a ‘screenshot worthy room’ in that time. I did this on-stream, and it resulted in the below room! Unfortunately I had to have the reflections removed due to the lag the map as a whole was eventually suffering with. The screenshot below still has the floor reflections on show, for archival purposes if anything else. 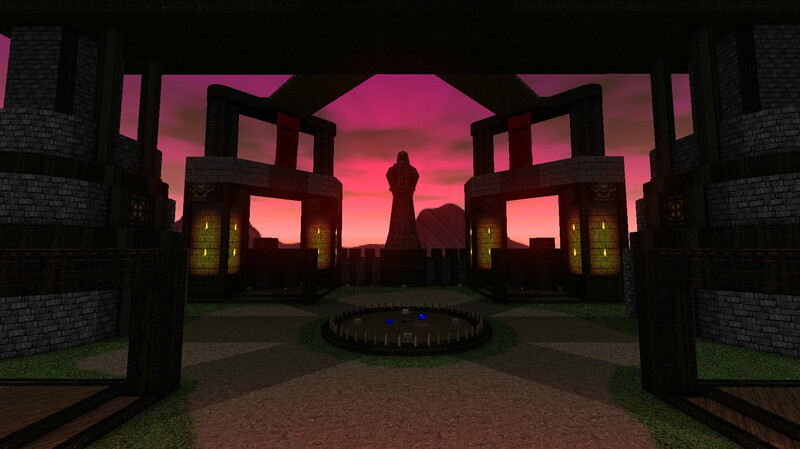 All that was left before I moved onto the boss arena was the blue key area and ‘finishing touches’ to the detail, as well as the area where the player uses the three collected keys. I wanted the player (in this case, Joel from Vinesauce) to have a good understanding that thanks to portals this map is a very 3D structure, so instead of being just a pretty rooftop it also is a playable area! 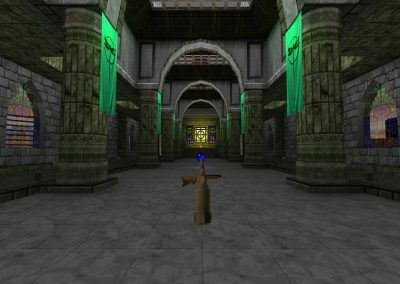 On the way up the spiral tower stairs to the rooftop the player is granted the chaingun and super shotgun, then when on top has the opportunity to mercilessly slay dozens of zombies. 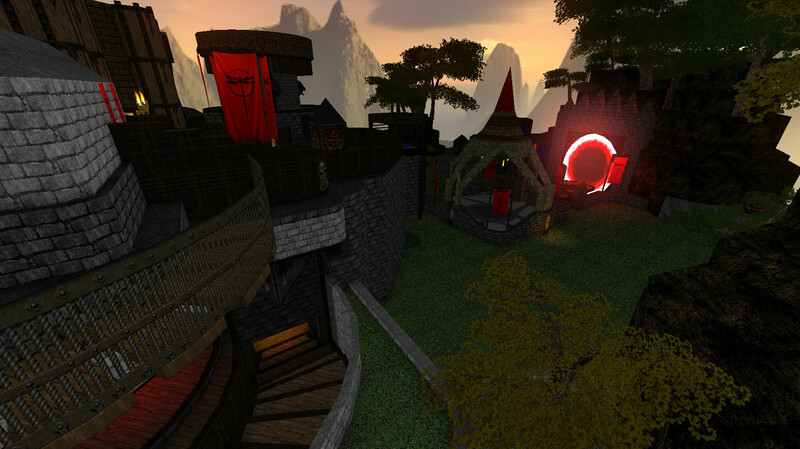 When you reach the blue key you are on a balcony overlooking the entire “KeySwitch Area” to really try and drive home the 3D feeling; but in case this wasn’t enough I added a secret area. In this little secret you get to walk on a wooden plank walkway around to the other side of the fortification. 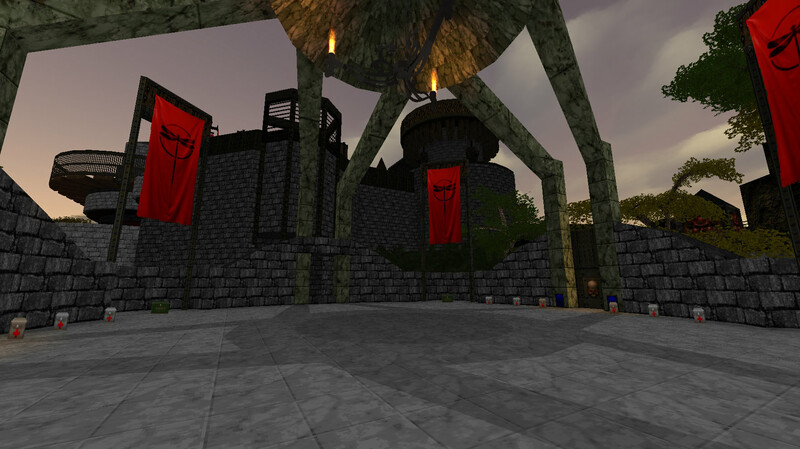 On this walkway you can look below and see enemies… Or their corpses, should you have already been there! 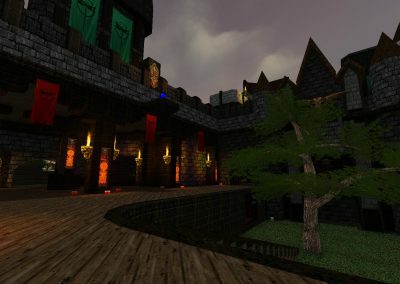 While I was working on this map, I was fortunate enough to strike up conversation with Zanieon who is the author of the ever-impressive Hunter’s Moon. 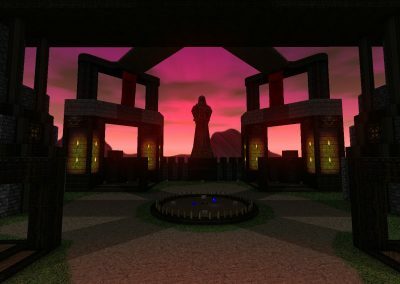 I noticed they had several Quake 3 Arena 3D models in their project and wondered if they would be kind enough to assist me in ripping a few of the decorative ones (statues, mainly). This conversation built a nice little friendship where Zanieon not only provided me with the Q3A assets as requested, but also guided them to my Doom Streams – while watching me stream the creation of this map Zanieon had a fantastic idea for the portal effect I was trying to achieve; and off he went to craft me a fantastic animated 3D model of a portal, complete with sounds! Once I’d implemented this portal into my map I was extremely excited and felt the need to use one of Gutawer’s Shaders to create the ‘post production style pulse blur’ which gives the portal’s opening animation a real punch, creating a strong impact. Lastly, at my request, Zanieon created a 3D model based on the flag model from Quake 3 Arena which was able to ‘roll out’ and then wave in the wind. He did a fantastic job of this, and the ‘unfolding’ effect was used to great effect during the boss arena’s unveiling. Order of the Odonata was title-less for most of its lifespan. 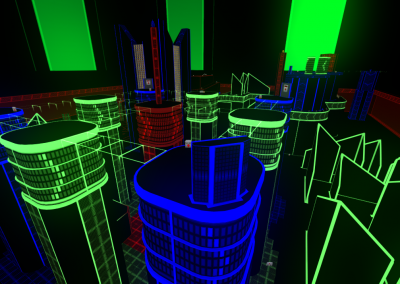 I initially added red and green flags to the map to liven it up and give colour to the architecture. As a test to see what could look good on the flag I added a slightly modified version of my ‘dragonfly emblem’, and it seemed to really work with the style of the flag; this ended up sticking despite feeling somewhat egotistical. About a week after adding these flags, I realised I needed a name and felt like the Dragonfly aspect needed to be made more obvious. Without being too ‘in your face’ about it and calling it “Fort Dragonfly” or something to that effect, I looked further into Dragonflies as a species, and found that they are part of an order of carnivorous insects called the Odonata. This name stuck with me and the implications of being part of an “Order” felt somewhat archaic and mystical, which from my perspective suits the map’s aesthetic. 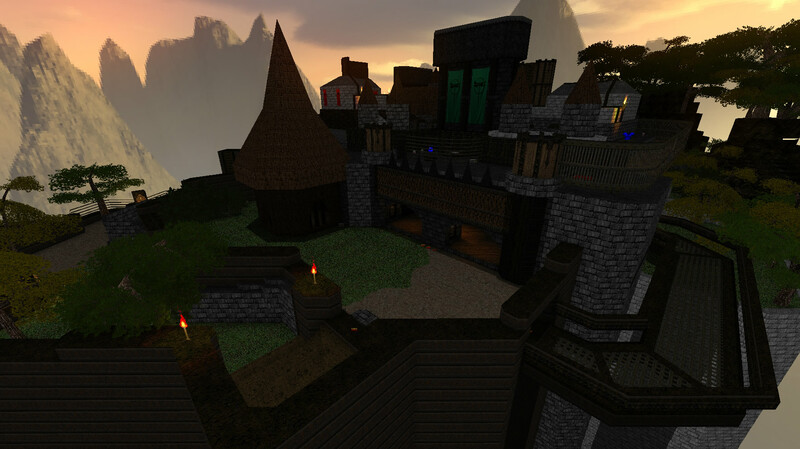 As mentioned above, this map had serious lag issues. These were caused by the extensive use of portals. 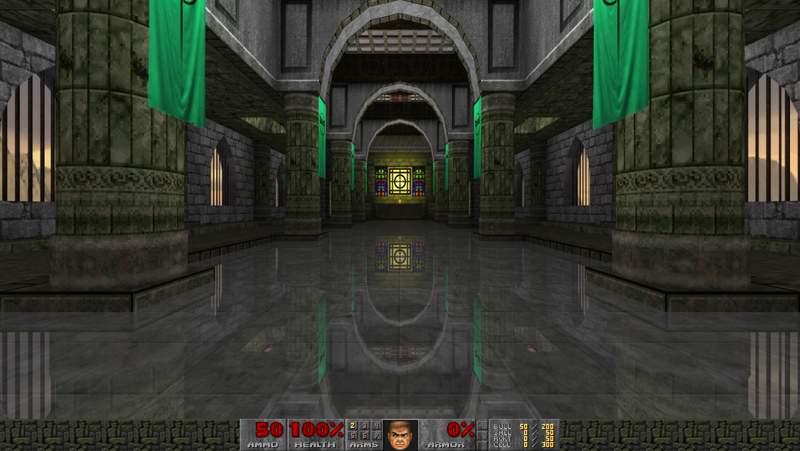 The way rendering in GZDoom works is that unless your view is obscured by a 0-height sector or a 1-sided line, the sectors in front of you are rendered, even if the player can’t technically see them. 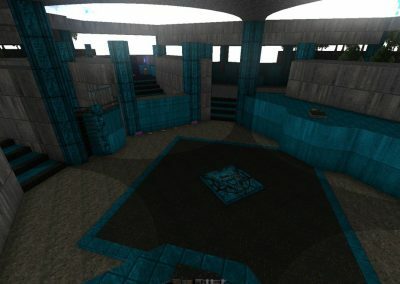 In a map like this with extensive portal use, it meant that there were many angles which had a good 50%+ of the map being rendered! 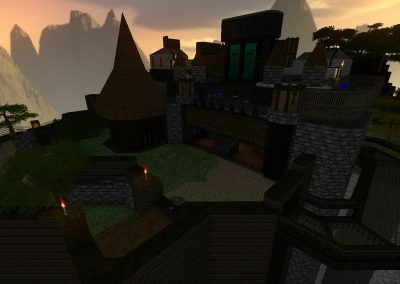 This was terrible for performance, so to fix this as best I could without having to re-do entire areas I implemented some full-height structures on the roof of the map. I also removed the reflections as earlier mentioned. Once I’d finished getting the map back to a bearable / decent frame rate I could turn my attention to the boss battle. At this point I didn’t know what the boss was even going to be, but because of the time constraint provided by the contest’s deadline and my late start, I “just got on with it”. So, within a short amount of time into the development of my boss arena, I decided two things. 1) the boss will need to be a flying enemy with large attack coverage. 2) The arena would be much cooler if it ‘built itself’. 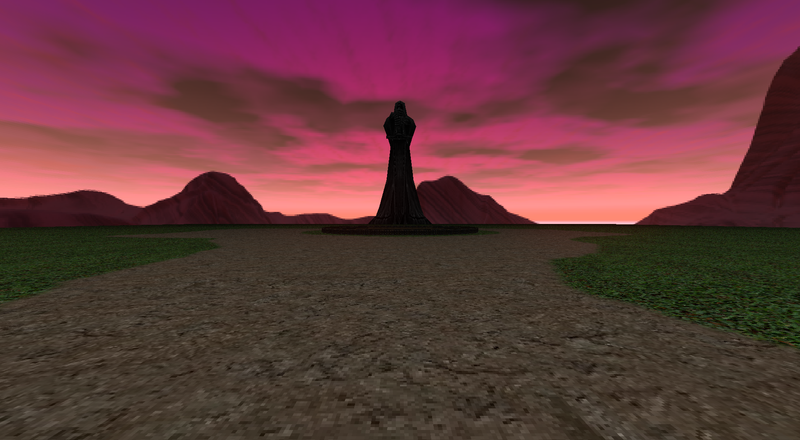 Passing through the portal initially leaves you in a more-or-less empty field. 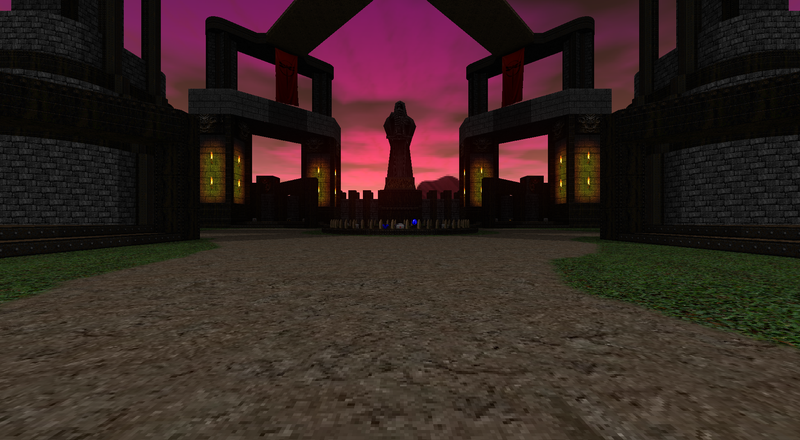 Shortly after entering however the arena ‘constructs itself’ in realtime around the player. This seemed to ‘turn head’s when the GIFs were posted on Doomworld, which felt great! The construction effect wasn’t the easiest to create, and it was made even harder by using a stacked sector portal in the area. In hindsight I shouldn’t have used the stacked sectors, but I was too-far-gone by this point to allocate time to re-doing this effect without them. Interestingly this portal usage also caused a reproducible crash-to-desktop error in GZDoom which I reported to the developers, which made me have to change the portal from interactive to visual. 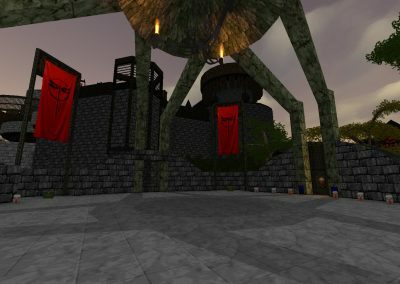 I believe the error that was caused will be fixed by the developers for future versions of GZDoom. Below is three screenshots, all taken standing in the same exact spot! The boss itself I created using Amuscaria’s “Infernal” sprites (with their permission, of course) from their fantastic project called Hell-Forged. While I was using some sprites from Hell-Forged I decided to use what little storage space I had left for the project (20MB limit) to replace the Revenant, Arachnotron and Mancubus with their armored / gothic equivalents seen in Hell-Forged. Shoot several fireballs in an arc. The center fireball is a sticky bomb. 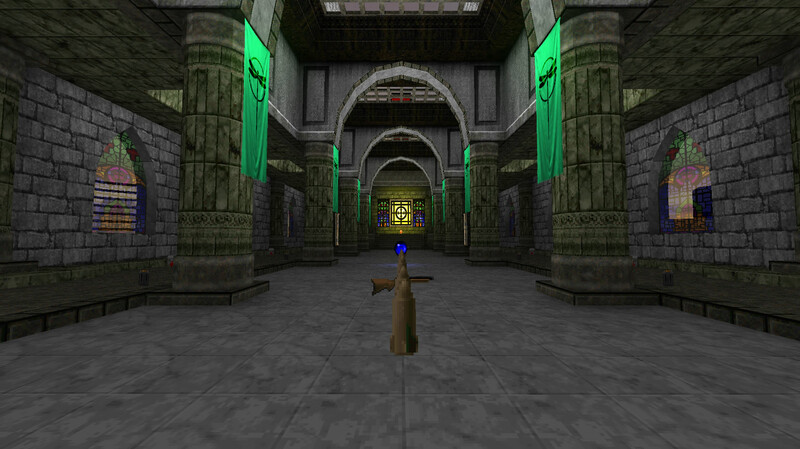 For this attack the boss teleports to the center of the map, waits approximately 1 second and then showers its basic scatter shot in quick succession in the player’s direction. This has a low random chance of stopping, so it generally speaking gets off anywhere between 5 – 25 shots in a row. This can be stopped by pain state. Internally coded as “MineFart”, this attack calls a script which boosts the Infernal’s movement in the direction it’s facing, then causes it to drop about 20 sticky bombs directly downwards. This attack can really zone the player off and, if especially unfortunate, cause the player to die very quickly. This attack was given a low random chance to instantly re-perform this attack, meaning it can relentlessly chase the player around the arena. 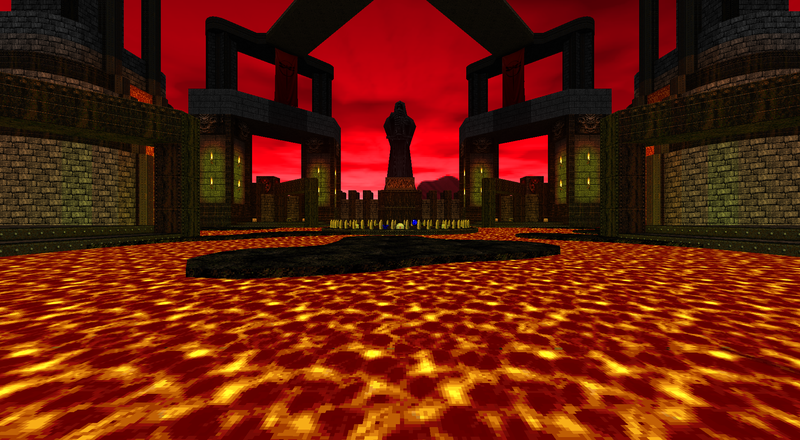 When the boss is whittled down to approximately half of its health, a second transformation happens to the arena mid fight, where rocky platforms rise from the earth, the walls transform into lava flow and the floor subsequently becomes molten hot lava. This makes movement during the fight much more important. As a by-product of the increased movement challenge, the Bomber Mode attack becomes a lot more effective. 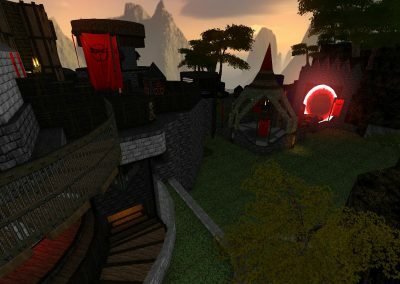 Much to my surprise I was able to get the map completed, tested by a select few people, bugfixed and ready for release with a couple of days left. This allowed me some time to create a titlepic, along with a titlemap to give this image some motion. I also created a new HUD graphic to coincide with the graphical direction of the Titlemap. I’d like to take this opportunity to thank Joel immensely for hosting a competition that puts Doom in the spotlight for hundreds/thousands of people! 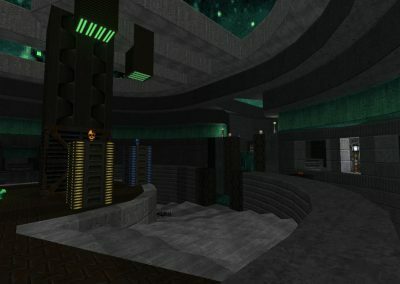 It provides incentive for experienced mappers to pump out quality work; all the while inviting new and younger mappers alike to get into Doom and keep the community alive. 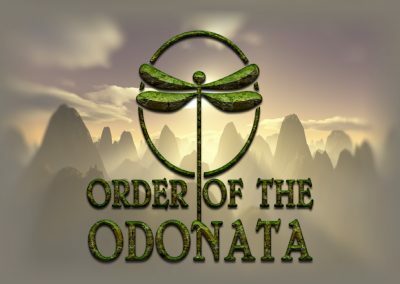 I know that Order of the Odonata is only one of 300+ maps that Joel will soon be playing; I wish every participant good luck and hope that Joel has a blast playing the maps as much as his audience will enjoy watching them.